Totally english section for worldwide fans! Legendary voice actor for Raoh & Kaioh sadly passes away. SHIN HOKUTO MUSOU IN DEVELOPMENT FOR THE WiiU! Ken's Rage 2 "Impressions" by French Gaming Site "JeuxActuTV"! HOKUTO DESTINY TO COVER TOMORROW MORNING'S LIVE USTREAM EVENT FROM TOKYO! 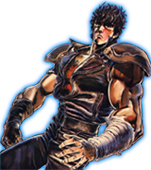 FIST OF THE NORTH STAR KEN'S RAGE 2 TGS 2012 TRAILER! GAME DUE "FEBRUARY 2013"
SHIN HOKUTO MUSOU SITE UPDATED, TREASURE BOX & RELEASE DATE ANNOUNCED! 20/12! FAMITSU TO PUBLISH MORE CHARACTERS THIS WEEK! TECMO KOEI TO HOST A LIVE "STAGE EVENT" FOR SHIN HOKUTO MUSOU/KEN'S RAGE 2 SATURDAY, 22nd SEPTEMBER !! SHIN HOKUTO MUSOU/KEN'S RAGE 2 TO HAVE ONLINE CO-OP VIA DREAM MODE! KOINUMA SAN "FIST OF THE NORTH STAR KEN'S RAGE 2 PLAYABLE AT TOKYO GAME SHOW" !! NEW SHIN HOKUTO MUSOU/KEN'S RAGE 2 PLAYABLE CHARACTER CONFIRMATIONS VIA WEEKLY FAMITSU! HOKUTO MUSOU KENSHIRO'S "SEIYUU" RETURNS FOR SHIN HOKUTO MUSOU! KOINUMA SAN "WHETHER WESTERN RELEASE GETS A DISC, IS STILL PENDING"
Bonne fête 2012, Acadie! Happy aniversary!